The most important thing you can do to prepare for winter is to ensure your colonies are healthy. Hopefully you’ve been monitoring religiously for mites, treating if need bee, and have the counts under control. For any colonies that don’t make it through the winter, in the vast majority of cases, the cause will be an infestation of Varroa mites. They shorten the lifespan of the bees, compromising their foraging, their care of the next generation of bees, and their health. I live to make Varroa die, but will rein myself in and discuss winter prep now! The weather extremes of this mid-October have been hard on bees. The warm days have allowed them to be very active, but there’s not much out there to forage. So as they fly around looking, they’re consuming their winter stores as fuel, and not putting much back into their cupboards. Because it’s felt more like summer, we’re behind on winter prep. We went thru most of our colonies last weekend, and were dismayed how light many of them are—and these are the same colonies that a month ago had the 100+ pounds of honey that experts recommend they have. And the top cover goes atop all of this, and they can eat come rain or shine without having to defend their food. So, we’re offering them sugar syrup inside their home (like from jars enclosed in an empty box and over the inner cover so robbers can’t access them. And remember, this time of year it is 10 pounds of white sugar to a gallon of water, or 2:1). Not all colonies are taking the feed. Typical, but puzzling! What we do is what we’ve found works for our hives in SW Michigan. What others do, especially in other geographic areas, varies. Consider feeding. Hopefully you’ve all ready been doing this for any of your colonies that are light going into winter. Even if your colonies had plenty of honey, you may want to offer supplemental feeding so they can “top off” what they’ve used during these warm days. Play God. I hate this part, but weak colonies don’t make it through the winter. IF we have a strong colony to combine them with, and IF I know why they’re weak (and it doesn’t appear to be any health-related issue), we combine weak with strong. Combining weak with another weak just makes a bigger weak colony. We do newspaper combines and kill one of the queens. I hate choosing which one and killing her, but if the small colony will likely perish anyway, adding numbers to the strong colony makes sense. Assess their stores. The guideline for SW Michigan hives is 100-150 pounds of honey to make it through the winter. A full deep frame of honey weighs about 9 pounds; a full shallow about 4. Hopefully you made this assessment over a month ago and have been feeding any that seemed light. We like to err on the side of caution and leave too much rather than not enough. 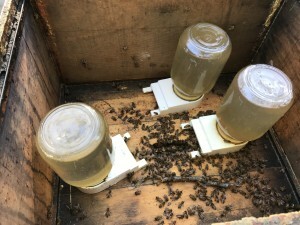 We pulled and froze honey frames in August, and are thawing those and putting them on light hives. Feeding allows them to make their own honey, but when it gets cold, they won’t be feeding. Reposition stores. The human experts tell us the bees should be in the bottom box with the brood nest in the middle, honey on the sides, and honey on top of them. The bees, who are way more expert on bee-havior, may have chosen to do otherwise … and they may have really good reasons. We’ve seen 10-frame colonies that never draw out the last two on a particular side, and that probably has something to do with wind or sun exposure. 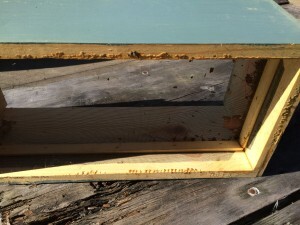 But, using wherever they’ve located the brood nest as a guide, we try to make sure any empty frames are moved to the farthest outside positions, and we try to make sure they have a “honey ceiling.” Bees are “chimney eaters” – they’ll eat up as winter progresses (as the heat they generate softens the honey). Thus, they need honey overhead, much like you’d find in a tree of bees. Reduce the main entrance and likely other entrances. Hopefully you’ve already done this to discourage robbing, to hold in heat, and to deter critters from entering. Let’s chat further about each of these. Robbing has been intense in these parts this year. An external front feeder is an invitation to a banquet, so you don’t want to use those from about July on. The colony will spend more time defending their doorway, and less time foraging. Most of the yellowjackets and wasps are gone now (amen!! ), but other colonies will rob given the weather and opportunity. We normally have a nickel-size hole in each box for ventilation, but they’re taped off for now. Heat retention is also helpful. Most colonies will have some brood until December-ish; let’s help them keep it warm. Critters are looking for a warm, dry, honey-laden banquet, and a hive is exactly that. Thus, we have our wooden entrance reducers positioned to the smallest gap, and have hardware cloth over them. I have photographic evidence that a mouse can both chew through wood to enlarge the opening, and can get through an inch opening. Most of our colonies are out in a field, so varmit attacks are a common thing. I scraped out that curly-tailed critter back before I learned to get the guards on in early October. The varmit was quite dead, as were the dozen or so bees lodged in its fur. I surmise it was stung to death. Sorry to lose that many bees; not sorry about the dead mouse. It doesn’t matter how strong your colony is—they won’t / can’t defend against an intruder once they go into cluster. Thus, a critter can scamper in when it is cold, wreak havoc, and scamper out before the cluster breaks up and stings it to death. About the bottom slider board: We DON’T use it in the winter (like mid-November on) because ventilation is important. But, until we’ve got the hive skirted so wind can’t gust up into it, we’ll use our slider bottom boards. Remove the queen excluder. Whatever honey you’re leaving on the hive, the colony needs to be able to get to it. They won’t leave the queen behind, so make sure she can also move up. Remove extra boxes: If they didn’t draw / fill that top box(es), they aren’t going to now. They don’t need an attic of empty frames. Add a sugar ceiling. Hopefully you have 100-150 pounds of honey, but regardless—a sugar ceiling is fairly cheap insurance should they run out of stores before things are available again. We like the Mountain Camp Method. (Detailed under ‘Publications’ on this site, or google it.) Easy, and about now is the time to do it—about now. If you do it too early, they’ll carry the sugar out, thinking it is a foreign substance. We’ll do it when we have a balmy day in mid-November. 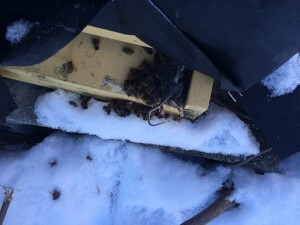 An unusually warm January day allowed us to check our bees and document that they like the Mountain Camp Method. Once you do it though, you can’t easily get back into the frames, so it needs to be one of the final things you do as you button up for the season. Allow for ventilation: The reason behind this is that bees shiver to generate heat in the winter, which creates moisture. That moisture rises, hits the cold top, condenses, and drips back down upon them. Bees have a harder time surviving being wet and cold rather than just cold. There are a variety of things we do to address this. First, we have 5/8” upper entrances in 2-3 boxes of each colony to allow for ventilation, and so bees may come out on an unusually balmy winter day to defecate, when their lower entrance might otherwise be covered by snow. These holes are usually on the southern or eastern side of the boxes. We go a bit bigger than other recommendations because we’ve seen bees die in that hole and block it. Drill the holes now, but you may want to keep them closed over until all the yellowjackets and wasps are dead, and most raiding colonies become fairly quiet due to cold weather. Second, when we skirt three sides of the hive (see below), we remove the slider boards and run until spring with screened bottom boards unblocked. Looking at the inside of the absorption box, from the bottom. Because my husband (God bless him!) has these skills, he also cuts a half inch off the top lengthwise sides of that special box – so air can flow across the top of the box a bit and keep the chips dry. The top cover shelters that minor gap. Alternatively, you could drill some holes above that screen so air can flow across the chips. Skirting: When we think winter is truly, generally here (mid-November? ), we will pull the slider boards, and skirt three sides of each colony with house wrap paper and a staple gun that never, ever works right. This keeps prevailing winds from gusting up under the hive. If the colony was light on stores, we may extend that wrap up higher to help them to stay warm. Black house wrap on three sides draping down to the ground, a couple scrap boards for a windbreak, plenty of weight on the top, and vent holes higher than hopefully snowfall! Add wind blocks: Lawn chairs, junk cars, straw bales—anything to break the wind—that your neighbors will tolerate! Check out the surrounding limbs: Any dead limbs that could break off and knock over the hive? Take them out. Styrofoam insulation: We have a handful of nucs we’re taking into winter. We’re going to bungee-cord ½” sheets of Styrofoam around those, for extra warmth. 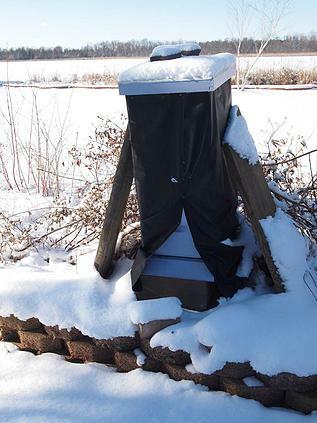 If you have a small hive, you may want to do something similar to help them stay warm. Still with me? Yes, that is a long list, but that’s how we keep our bees alive. As always, I welcome your constructive comments and questions. And don’t forget to tell them you love them as you tuck them in!